While $300 is a lot to spend, you get a lot for it. Among true wireless earbuds, it's tough to top the sound quality, controls, and fit of the Sennheiser Momentum True Wireless. How is the build quality of the Momentum True Wireless? I have to say, I’m impressed with Sennheiser’s use of materials on the Momentum True Wireless. Not because they’re resplendent with precious metals or anything, but because they’re mercifully light and durable enough to withstand a normal user’s wear and tear. You may be taken aback at how light each earbud is relative to its size, but that’s a good thing. It means that each will stay put in your ear canals without too much force applied to your sensitive bits. The Sennhesier Momentum True Wireless can get two charges out of the battery case. Sennheiser is a big name in consumer audio, and there’s a lot of pressure to stay ahead of the pack when it enters into a new product category. True wireless has had its share of hiccups with users ever since the AirPods debuted, but there’s finally a credible array of purchasing options that work well at any price point. In order to charge a lot of money for a set, you need to knock it out of the park—and until now nobody’s really done that. Among the $300 options out there, Samsung’s Gear IconX has terrible battery life, and both Master and Dynamic’s and Bang and Olufsen’s options have connectivity issues. The Sennheiser Momentum True Wireless gets all that right, without suffering any major drawbacks. In our time testing, there really wasn’t a point where we ran into a problem that couldn’t be solved by thinking it through. Believe me, that’s a lot less common than it sounds. The grey fabric battery case is an attractive but mercifully small recharge station. Additionally, the build of the charging case is very attractive. Covered in a coarse cloth, it offers USB-C charging to top off your buds without any interruptions in the exterior. What is it like to use the Momentum True Wireless? 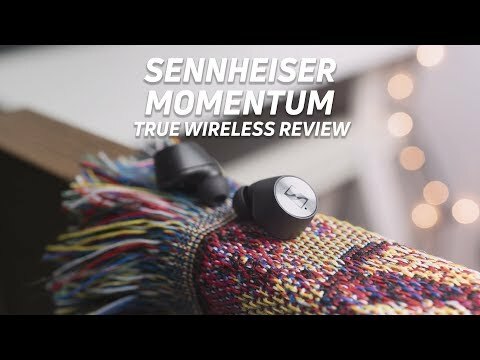 It’s easy to get a little lost using the Sennhesier Momentum True Wireless out of the box, but with a little guidance you’ll forget about even setting them up after a while. Just be sure to keep the device you want the earbuds to connect to as the only device in range, because it sometimes gets confused. Moving the dot around can change the way your music sounds, adding bass, treble, etc. Once connected, the app can take greater control of your earbuds. Definitely be sure to download the app if you can, because it allows you great control over your sound. You can click around the screenshots here, but the interface is pretty intuitive, and it allows you to make the most of your purchase. Once they’re in your ears, you can use your earbuds to control playback, answer calls, or pause your music if you take the buds out of your ear canal. While we’ve been spoiled as of late with touch controls, these are quite good for a set of true wireless earbuds. How is the connection of the Momentum True Wireless? Though a few models of true wireless earbuds support aptX, only the Sennheiser Momentum True Wireless offers aptX-Low latency. This is huge for late-night TV watchers, gamers, and anyone who isn’t satisfied with AAC. Essentially, this affords anyone using the Momentum True Wireless with the best available Bluetooth codecs, even removing your phone from the performance equation. However, iPhones only support AAC and SBC, so be mindful of that if that’s the device you own. It doesn’t use the latest Qualcomm radio features, but the connection of the Sennheiser Momentum True Wireless earbuds is still quite good. I also can’t find any documentation that confirms that the Momentum True Wireless uses Qualcomm’s TrueWireless Radio Plus feature, so it seems like you’re still relying on the master bud/slave bud connection. It’s not ideal, but not really an issue. At an average rundown of 3 hours and 45 minutes per charge (75dB), you can get a decent amount of playback out of the Sennheiser Momentum True Wireless. It’s not the best—nor is it the worst—but you will have to take some breaks with these over the course of a week. That’s not so bad, though. You can get two extra charges from the battery case, so you should be able to squeeze just about 11 hours total out of one wall charge. How does the Momentum True Wireless sound? Before I launch into how the Momentum True Wireless sounds, I feel like I should point out that there’s a reason Sennheiser is widely regarded by audiophiles and casual users alike: the company knows its stuff. While that dip in the high mids might look a little strange, it’s really not—because in past Sennheiser in-ears, that dip is there for very good reasons. Namely, their engineers found that the range from 2.5-7kHz tends to present with resonances in human ear canals, and sealing up your ear canal with something like a silicone plug would make them far worse. And it makes sense to underemphasize that range a bit, especially if to a human ear it’d sound a little different. Despite our equipment and best efforts to calibrate to a head, there will always be differences in our test rig and your ears simply because there’s so much different from person to person. Having listened to these for several hours, I can confidently tell you not to put too much stock into that dip there. The Sennheiser Momentum True Wireless applies the lessons learned from several labors of love into a smart note emphasis. I’m a big fan of this kind of frequency response, because it means that not only will your music sound a bit clearer, but it also means that you won’t need to equalize it much. You can pretty much just nudge things a little bit here and there if you elect to in the app, but it’s not a prerequisite to enjoying music of all kinds. Considering that most notes in music live in the bass and mids, a flat response here—all notes roughly the same volume—means that your music will reflect how the producer mixed the sound more than how your speakers affect the sound on their own. This is really great for those of you who don’t want their skulls rattled by bass, and those who want to hear more details in their music. The Sennheiser Momentum True Wireless is one of the best true wireless earbuds in this regard, but not everyone likes this sound. If you like strong bass overemphasis, these in-ears aren’t for you. In most music tracks, the highest fundamental frequencies tend to live in the mids (green on the above chart). Typically, human ears need a little bit of a bump to hear them, and the Sennheiser Momentum True Wireless accommodates it well without taking too many liberties with the sound quality. Like I said before, don’t worry too much about the little dip after 2-7kHz: it’s largely something you won’t notice because of the nature of your ears. If you tinker with the settings, you’ll come across what’s called “Transparent hearing.” All this does is simply pump in a little bit of the world around you so you can stay aware of your surroundings. Several noise cancelling headphones have a feature that’s similar to this, but the effect is a little less harsh-sounding with Sennheiser’s implementation. You can always toggle it through the app settings if you don’t like it. Should you buy the Sennheiser Momentum True Wireless? If you’re looking for a set of luxury true wireless in-ears, the Sennheiser Momentum True Wireless is a smart bet. The industry stalwart packed in the features with this one, and it’s very apparent that it takes many lessons from chief engineer Axel Grell’s labors of love the IE800 and IE800 S. The unit sounds great, isn’t too heavy in your ears, and as of publish offers the best codec support of the true wireless sphere. However, $300 is probably a little too rich for your blood, and there are plenty of options out there that you might be happy with. For example, our picks under $100 are all pretty decent, and even some of the mid-range options in our Best true wireless article will get you about 90% of the way to the Momentum True Wireless. If you want better isolation, any model with foam tips will block out the world around you better than the Momentum True Wireless. Additionally, the Sony WF-SP700N, Sony WF-1000X, and Mobvoi TicPods all offer active noise cancellation—though it’s not amazing quite yet.